Software testing is at a very important crossroad, where it is going back to the roots on certain fronts while moving inexorably forward. For instance, test automation is growing in prominence, but manual testing is becoming a niche; we are increasingly collaborating with the developers, breaking the bounds of unrealistic independence in testing, and bringing in true conscious quality. At such an important stage, it is important to take stock of the past, present, and future to define both the direction the discipline will take as well as the careers it will entail for testers. 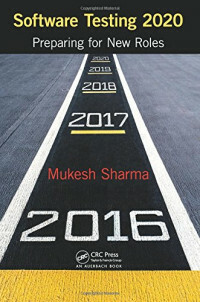 This book looks at a range of topics covering where we are in the product development landscape today, what are the varied disciplines at play, what are the influencing factors bringing in a change in software testing, why is such change important, what did the past look like, what is current decade turning out to be like, and where are we heading. As for future, it looks at it both from near-term and long-term perspectives. It also considers whether the testing fraternity is ready to take on such changes and are empowered enough to do so, or are there gaps that need to be filled. The book closes with perspectives from industry experts on what is in store for the software testing discipline and community in the coming years. After reading the book, you will be confident that you can take on what is in store for testers in the coming years. You will also be positioned to help the industry move to the next level, and influence change not just amongst testers but also in the product engineering industry level as a whole.